The batteries and adapter is not included. The camera showed in the pictures is not included. Formed by 96 LED beads with 3200K color temperature and another 96 beads with 5500K color temperature, and the 192 high-quality large LED beads offer higher brightness with the same energy consumption. 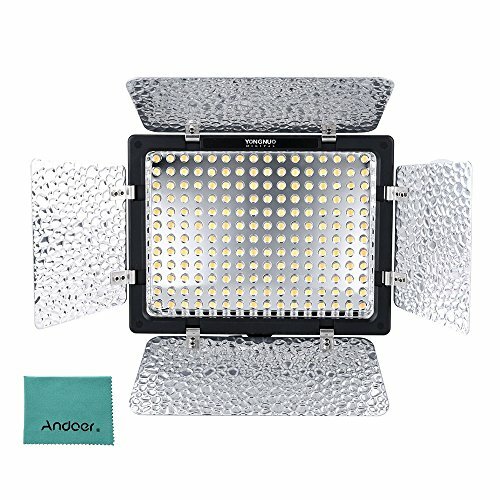 Extra-large luminous chips, brighter light, more evenly light spot and longer service time. The color temperature can be adjusted from 3200K-5500K to meet your needs of more shooting situations. Adopts encoder digital dimming system which can be separately adjusted to rough tuning and fine tuning mode, more convenient to use. Set button(memory button) and relevant function which can remember the luminance and color temperature as you need, convenient for your next use. Silver reflector help you to gather the light better. Battery button and digital display screen allow you to view the dump energy.